Norton has a chart that drives me crazy. It's here - scroll to the bottom of the PDF. It's a basic comparison of the grit size of various sharpening media. It's wrong. Worse, it's misleading. The reason is the chart covers nominal particle size for a grit. Not the particle size after you put a little pressure on the grit for a few seconds as you sharpen. And the chart doesn't (for example) differentiate between sharp, hard diamond particles which leave a bigger scratch pattern than soft rounder aluminum oxide particles of the same nominal grit. Nominal grit rating means for the a 1 micron diamond powder you will have a range of grits from 2 micron to way under 1/2 micron. Of course only the largest particles will do any work and they make nice scratches. On a nice friable waterstone of say 8000 grip. Norton rates it at 3 microns in the chart but it's also JAS compliment so it must be under 2 microns - average particle size. The larger particles will quickly fragment so the scratch pattern will quickly be much finer than similar diamond powder. Arkansas stones wear in over time and get a lot smoother with use. The large crystals of novaculite quickly round over and the rounded crystals cut much smoother (and slower) than the nominal crystal size would dictate. Everyone understands about the cutting slower but since you can get equally sharp blades from arkansas or waterstones (in carbon steel) the grit comparison is worthless. How come then the edge made by waterstones is all reflective but the Arkansas stone isn't? I puzzled over this but I think I know why. If you are sharpening with an Arkansas stone you are moving a flat stone over a bit of steel. If you do a micro-bevel you might get a polish because you are polishing over the entire micro-bevel and since you are only sharpening on a small area there is enough pressure so you might remove enough material to get past the scratches of the previous stone (usually a medium india). On a full bevel that's a lot of steel to remove when most of what you are trying to do is just remove a wire edge and you would need perfect contact all the time. So no polish. With a friable water stone the slurry trapped between stone and bevel and the grit breaks down and just polishes away, going into the coarser scratches and softening their edges. The polish isn't really reflective (a pun get it) of what's happening at the cutting edge but it does look shiny. Having fewer sharp scratches at the cutting edge supposedly increases edge life - which can also be easily accomplished with oil stones with a micro bevel. The Chosera 10000 Grit water stone is officially coarser than the Naniwa 12000 grit Super Stone. Both are made by the same company but I don't know anyone who doesn't think the Chosera 10K is the finest artificial waterstone out there - and it produces a finer edge than not only f the 12K superstone but also a Shapton 16K. Why?? All waterstones are not alike. It not only depends on the abrasive but also the binder. Manufacturers play with the ingredients to get what they feel is the right mix of speed, quality of cut, and stone maintenance. Norton water stones by the way, are a great compromise between price, speed of cutting and maintenance. 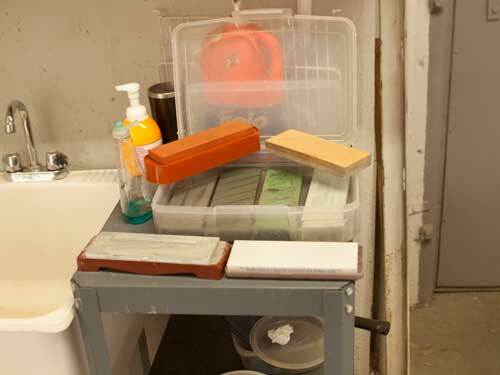 If you want a stone that requires very little flattening oilstones or Shaptons are great. If you want a stone the doesn't need to be soaked but has the friability and finger feel of a harder natural stone, you can't beat a Super Stone. You want a friable stone, that feels like a top quality natural stone and cuts demon fast? Chosera is the way to go. Lapping film is great for low cost, and very fine grits, but the grits are really friable and you don't have the feel of a great stone. Still it's a great and inexpensive way to get a professional edge and we recommend it for everyone starting out. Here's my point when you are selecting sharpening materials: figure out what characteristics you want. Try to learn about the different characteristics of different types and brands of abrasives and pick something that works for your style of sharpening. Just about every sharpening system by every manufacturer work, but they work differently. At home I use Super Stones because I am always in a rush, Chosera stones (yes I have everything ever invented it's my job) when I want to do the best job I know how and have fun in the process - the stones feel so good in use. At work - I use whatever is closest. Diamond, much harder than any steel, cuts deeper than other abrasives with the same pressure so it takes more effort to remove the scratches made by diamonds unless you're using finer diamonds as the next step. BTW, wouldn't it be great if every seller of sandpaper and other abrasives would specify the grit correctly? I mean P400 (FEPA) just isn't close to 400 (CAMI). For example, how does a Norton Bear-tex 1500 grit pad compare to a Mirlon pad, also 1500 grit? The Norton is finer. Diamond cuts deeper because the crystals are sharp and don't break down or dull and there is a large variance from nominal grit size. Recently I had to deglaze a Shapton #120. �I used a coarse diamond stone &#40;#325&#41;. �It smoothed the surface far too well. �Presumably the harder diamond was shearing the tops off the alox crystals. Next effort worked much better: #36 SiC grains on glass &#40;following detailed instructions from Stu Tierney from ToolsfromJapan.com &#41;. Sure wish you guys would carry the diamond film, too. I sharpen straight razors, and love the 1 micron, .5 micron, and .1 micron diamond films. They last longer than non-diamond films and cut faster. After initial sharpening on either synthetic or natural stones, the diamond 1, .5, and .1 micron films leave and edge that is just unreal. Too bad it's so hard to find a place that carries these films.